Camembert Cheese for sale. Buy online at Zingerman's Mail Order. Gourmet Gifts. Food Gifts. 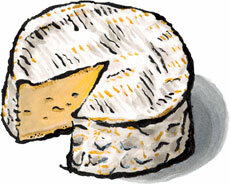 While brie is often the French fromage of choice in America, Camembert is the king of the cheese counter in France. That may be in part due to the difference in flavor. Head to head, Camembert usually has more flavor than brie. It’s much more complex; I might even call it daring. That’s meant two things for Camembert in America. One, it never got terribly popular (we don't seem to go for daring foods). Two, its flavor has been simplified—in a bad way—to the point where it resembled a chalky, bland version of brie. And who would want to buy that? Not many, apparently. Now comes a Camembert with a chance to stop the downward flavor spiral. We bring in Camembert that's closer to its French roots as a complex, compelling cheese. After two to three months of aging, its exterior is bumpy and patchy. The aroma and flavor are unique. There’s something about it that reminds me of cauliflower or cabbage, a fall vegetal scent that makes it a great complement to toasted nuts or sweet pears. If you’re looking for Camembert with flavor, you’ve found the right place. When you unwrap Camembert you may smell ammonia. That’s normal for a cheese with a white exterior mold. Let it sit unwrapped for a bit and the scent will go away.